Creedmoor currently offers .223 Rem competition ammo loaded with three of the most popular projectiles: 69 grain Sierra TMK (Tipped MatchKing), the 77 grain Sierra TMK, and the 77 grain Sierra BTHP. All three ammo types are loaded in Creedmoor’s new production facility using brand new Lake City Brass. As with all Creedmoor Ammo, each lot is pressure tested and velocity tested prior to every round being hand-inspected and packaged. That gives you confidence that this ammo is consistent lot to lot. Given the quality of this ammo, it is VERY affordable, starting at $34.75 per 50-round box. That works out to $0.69 per round. At that price, when you consider hand-loading, you have to ask yourself “what’s your time worth”? Would that time be better spend practicing? 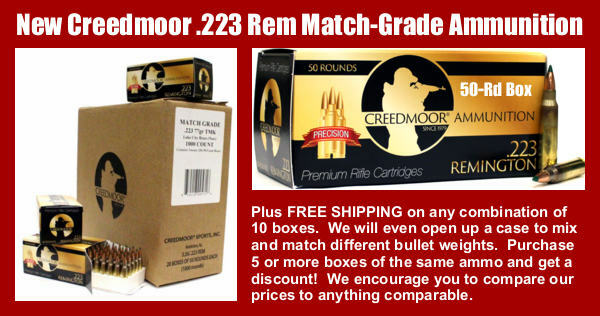 Share the post "Creedmoor Sports Offers High-Quality .223 Rem Match Ammo"